Town Badacsonytomaj of 2,600 inhabitants at the eastern foot of the hill. St. Imre chapel of the Paulite order erected and existed already in 1263 on the territory of the village. 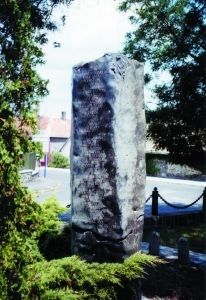 At the beginning of the 14th century the village belonged to the Szigliget Royal Castle. It was destroyed many times by the Turkish, and then repopulated in the early years of the 18th century; at that time it was the domain of Esterházy earls. In order to facilitate the exchange of goods with the other shore of Balaton, two large ferry-boats were put into operation in 1715. Inhabitants dealt with fishing, viniculture and wine-production. 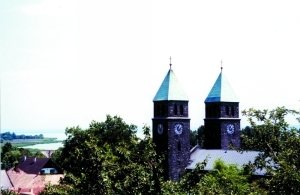 Economic prosperity of Badacsonytomaj started in 1903 when a basalt mine was opened in the village. Which is good for inhabitants that caused irretrievable damages on the eastern side of the wonderful hill. As a result of the long-term fight of activists of nature protection, in 1965 mining was stopped and the hill was declared a protected area. Badacsonytomaj is the centre of Badacsony wine region. Here only the Badacsony species of grape are grown: "kéknyelű", "szürkebarát", "Badacsony muskotály", "furmint" and riesling. Wines produced here are spread all over the world. 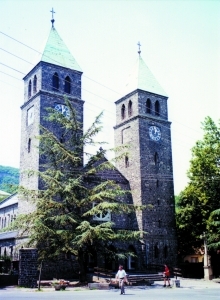 Architectural curio of the village is the Roman Catholic church of neo-Roman style constructed of black basalt stones. It was the first building of Europe of this character. Exhibition of the Museum of Regional History is close to the church (12 Fő street). Exhibitions of the fine arts in the community house of the town. Tapolcai hollow with the basalt hills bordering it provides perhaps the most varied scenery of the country. Two millions of tourists visit this region each year. The southernmost hill of the mountain is Badacsony forming a peninsula in the Lake. Summer cottage of the famous painter, József Egry, at the port; today the house of the "lover of Balaton" is a memorial museum. Greatest sight of the village is Badacsony hill itself. 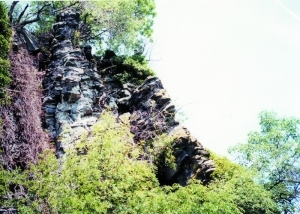 The shape and geological relics of the hill clearly show how volcanic mountains had been developed. The upper 'basalt cap' protected the soft parts of the hill from the effects of wind and water so only the surroundings of the hill had become thinner in the course of millions of years. Edges of basalt deposit have been continuously destroyed by erosion; this way the spectacular basalt organs and stone sacks had been created. The famous vineyards of Badacsony are located downwards from them, on the rich sedimentary ground. We can get to the Kisfaludy Villa and the press-house and living-house of the poet's wife, Róza Szegedy on an asphalted road from the port. Memorial exhibition of literature on the second floor of the building with a porch and a thatched roof. A steep path for tourists goes from the Kisfaludy House to Kisfaludy Look-out Tower (437 metres high). Top of the hill is worth walking round for on the western side Steps of Fugitives (Bujdosó-lépcső) go down to the shore. Wide variety of programmes in summer and autumn in Badacsony. Outstanding events are the Wine Weeks of Badacsony starting at the end of July and the Badacsony Vintage in the middle of September (national programme of two days with a spectacular procession, an open market and a vintage ball). An educational path established by Balaton Highlands National Park provides opportunity of a nice excursion for the path goes around the hill and tablets with explanations call the visitors' attention to the interesting sights. It starts from the parking-place of Kisfaludy House. Folly Botanic Garden with great trees and evergreens offers recreation if you walk to Badacsonyörs. Facilities of nice excursions from Badacsony to the surrounding hills (St. György hill and Gulács) and to the Castle Hill of Szigliget and the ruins on the top of Csobánc. There are two sights in the village, which are worth visiting. One of them is the chapel named Saint Anthony of Padua, built in 1816. Its panel paintings were made by Erzsébet Udvardy. The other on the western side of Ábrahám hill is the Folly arboretum, which is a collection of rarities of trees on 5 hectares. The viticulture of Badacsonyörs is acknowledged. Outstanding event is the patronal festival on Saint Anthony's day. Marked hiking paths go from the village to several sights of the surroundings from the Badacsony to the Káli basin.